After not doing any travel for work in the last three weeks, I got a little stir crazy and decided it was time to clean out my shed since moving to the new house. 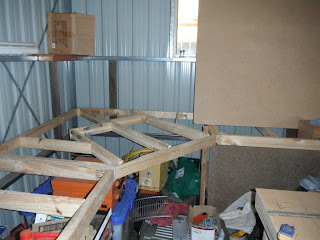 It all started out good until I thought I would duck down to Mitre 10 and have a look at prices on timber. Well I didn't know you could get non structural timber (35x75x2410) for $3 a length. 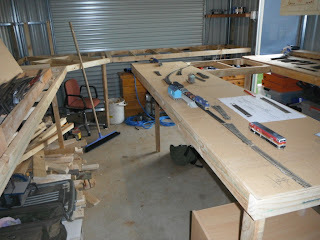 The visit ended with me purchasing 25 lengths of timber, 3 packing sheets of MDF ($5 each) and a nail gun. Below is the end result of working a couple of hours each night after work. I guess you could say I got a little excited as the bench work was up within the first week. I also found that using the nail gun instead of screws sped up the process massively. The layout has no track plan at this stage, just ideas of what I like about branch lines. Being that it is based on a branch line code 75 Peco will be used. To better represent a branch line I will pop out a few sleepers here and there, and try not to lay it too straight. The decision to use peco over hand laid was easy as I have a friend doing hand laid and it is taking far too long to get operational and the points can be a little unreliable, also I want to enjoy my layout before I die. I love the look of hand laid track but the time saved on track work can be put into the scenery and if I put enough work into the scenery no one will notice the track. The track will have grades in it and be roughly laid as a branch line would be. 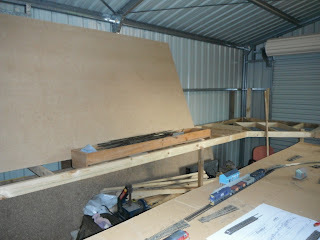 So the idea is to put the ply down on the base trace out where the track will be and cut out with a jigsaw. Then raise the track above the base at least 100mm to begin with then fill out with foam and shape. The intended era will be prior to the demise of the branch lines. So most trains will be short and of the 4 wheel variety. Large grain trains will serve the silos and ballast trains the quarry. The stations will be derelict and overgrown. The above photo is the terminus (44 class). It is based loosely on Boggabilla. This section of track will be a grain complex. Boggabilla is in the background on the right. Just a corner module. It will probably have a small passing loop before it with a PC1. A bridge will be on the short straight to the left. Another straight section and corner module. I will put a quarry loader on the straight section to serve ballast trains. The other end. For now it will be a terminus. 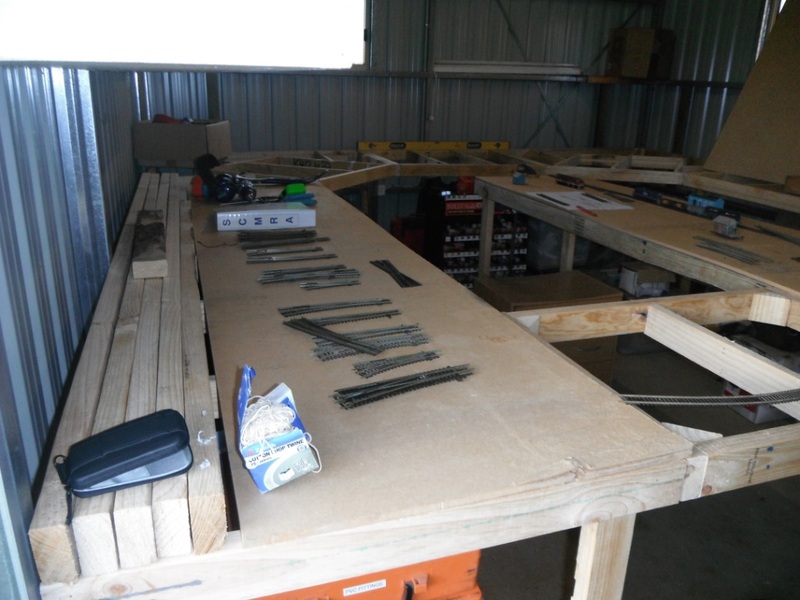 The whole layout has been constructed with dismantling in mind. In future when we move to the "dream house" this end will come directly off a helix and the whole layout will be the top layer. 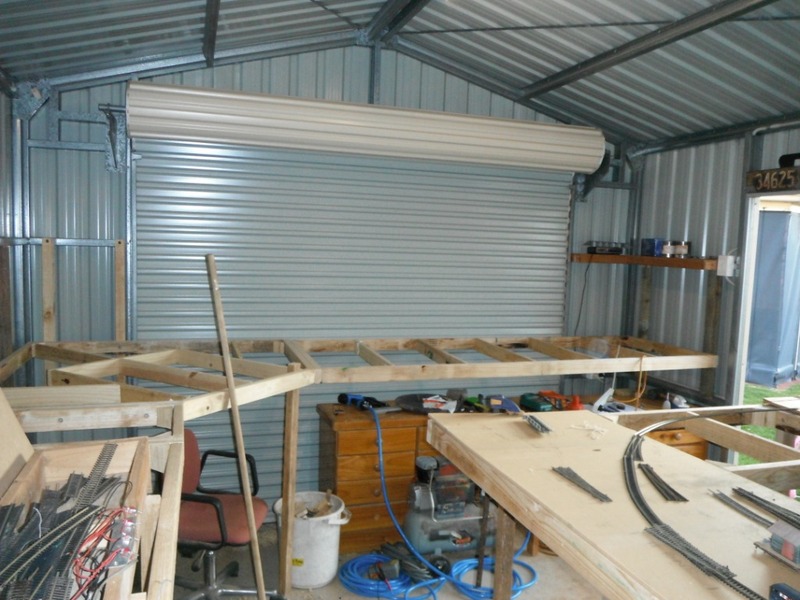 The lower level will be a double tracked loop to run large trains. But for now I am taking small bites and building the layout in stages.